Netball D-Day.. - A mummy's inane blabberings.. 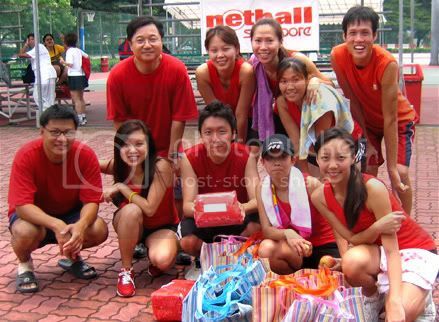 The SPH netball carnival was held early this morning. Hubby & Aidan came along to 'cheer' us on. 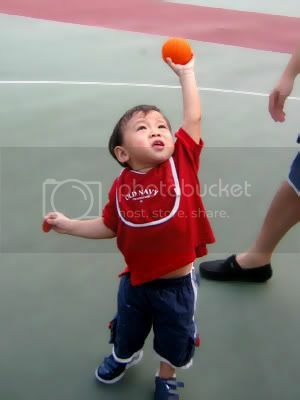 Aidan had his own game of netball with hubby as he happily played with his li' orange ball and attempted to shoot it tru the hoops. 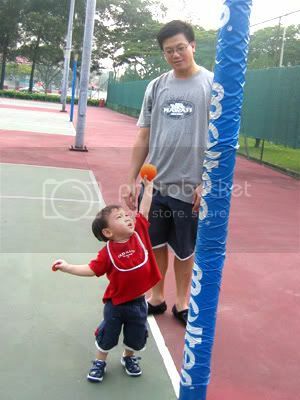 The li' bugger was so active, tearing up & down the court and he badly wanted to go where the action was (the courts where the games were held) and many a times, hubby had to run after him to prevent him from doing so. We fared pretty well I thought..We were in group 2 where we had to play round robin with 3 other teams that were from SPH print side. The other group consisted of pple from the magazines side and there were only 3 teams so they played lesser games. We won all the 3 teams in our group and was Grp 2 winner. But we lost in the semi-finals so SPH mediaworks ended up 2nd runner up after we'd won our last game which determined who was 3rd & 4th place. All in all, it was pretty fun..a li' sad & poignant though because it was definitely the last game of netball that Mediaworks would be playing as part of the SPH family. Someone actually started singing auld lang syne..
That's a hawflakes on his other hand..
Amazingly, he held on to it the whole time he was playing with the ball..
Aidan turned 21 months just few days ago....Can't believe that he'll be 2 year old by the end of the year. To me, he was just a wee li' babe just a while back and now, he's gonna be a big boy and won't be eligible for infant fare soon! Therefore, the plan is for us to bring the li' one for a holiday sometime before his birthday. Both hubby and I managed to take leave during the Deepavli & Hari Raya holidays so we'd decided to go around then. Aidan seems to be getting more vocal now :) He's considered quite slow in his speech especially since most of his peers are rattling sentences now but his teachers and the paed have told me not to worry about it and that he'll catch up in time. Yes, previously he does say some words and all but they are usually spontaneous vocalising. Nowadays, he'll start pointing to objects and naming them. Not big words though..simple ones..for example - tree (which he pronounces as 'tlee') and car, bird, pond...hmm, most of them usually when he's sitting in the carseat, looking at the view out of the car window. Come to think of it, he is more talkative when he's in the car. We should take him out cruising more often. And when he just gets home from playschool, he will go 'teecher- teecher' , 'apple' , 'book' nonstop! Honestly, it's definitely reassuring to see him talking more. He's also more loving and open with his affections. In the morning when he wakes up, he'll give me a slurpy morning kiss. When we're in the back of the car, he'll grab my hands and turned my palm upwards and rest his face on it. When he previously used to not want to hold out hands while walking, he now holds on to it tightly..And he's so much more giggly and happy now, constantly smiling and chuckling away happily. But he does get to be very stubborn too, especially if he doesn't get his way..I think it's the onset of the terrible 2s soon.. But he's still an independent boy. Since about a month back, he's been sleeping on his own bed in his room. Aidan started sleeping in his cot in the other room since he was born but when he was about 5 mths old when he fell ill for the first time, we moved him into our bed and he continued to sleep there since.. 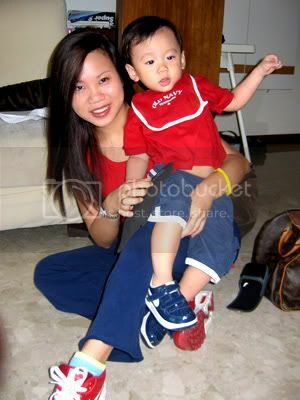 It was much more convenient for me too coz I was breastfeeding him then. We thought it was about time that he learnt to zz on his own so we bought a toddler bed from Ikea and placed it in his bedroom. We started by letting him drink his milk in that bed every morning & afternoon so that he'll get used to it. When we tried out the new sleeping arrangements a month ago, the li' bugger just accepted it. No whining and crying at all! And he slept like a baby on the first night and continued to do so..
Is it red or is it red? Looks like national day celebrations but you look real good and healthy! Anyhow, my parents said that I was really slow at talking (and walking, couldn't even crawl!) as well and for awhile they were worried I couldn't talk. But hey look at what a motormouth I am not! Think they're regretting it! ;p So I'm sure soon Aidan will be talking so much, making up for lost time! heh bopien. They got us red tops so we had to wear them.Thought i'll just let Aidan wear red so as to match us hehe..
Why is Aidan's bib always on? and aidan damn cute! lol he looks like he really thinks he can put the ball into the net. he was just imitating pple but after a while, he gave up 'shooting' and just threw the ball against the pole! you're looking healthy and fit! Tue after dinner maybe can bring our kids for a lantern walk .. maybe ask Gwynne too? good idea! I was thinking of that too. I'll try to come home early then. Say..abt 7.30? heh..u n my hubby the same. Always say aidan grow up liao and can earn money for us hehe..
erm..i think u r mistaken..it's probably fats :P..
hey..my hubby will be going to hcm in december..it's a company trip (wives not invited :( ) need me to get him to pass u anything? has it been so fast? Thank god for MSN and LJ where we keep in touch constantly! all our kids have changed so much..they all used to be botak and lying on their backs..drooling away (although aidan is still drooling :P).. And yeah, it was almost 1 1/2 years ago eh when we first met! 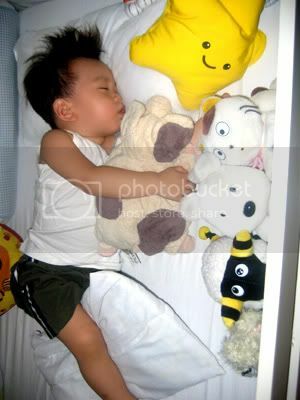 it takes time i guess..i tell u, when Caleb finally zz on his own, u'll miss him being ard ur bed! Good job to Aidan for sleeping in his own room. I want my 2 boys OUT of my room asap. Aidan's getting cuter each day! But now different kinda cuteness! The toddler kinda cute! *hee* And he's still so attached to piggy yah? I found my way to your blog through sheabutter's blog! Been wanting to ask you this for the longest time - which PlaySchool does Aidan attend? I'm helping my brother and sister-in-law short-list a couple of PlaySchools, when my nephew returns to Singapore at the end of December. 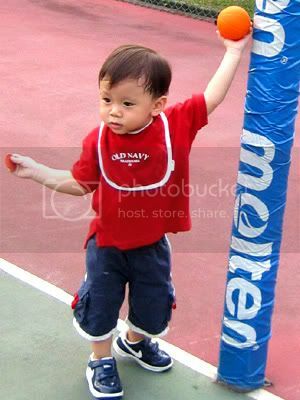 My nephew will be 18-month old by this December, and we're thinking of letting him try out playschool, early next year. What got me really excited was the live-cam thingy that the PlaySchool offers and I think that's the bestest idea, for parents, especially when they're travelling (like my brother and sister-in-law) and wanna just check on their son, when they're away!! There are many factors you bro n sil should consider when they do decide to place their child in a playschool. First they have to be comfy with the environment, the location, distance, teachers etc.. Some pple prefer more 'established' schools - eg, the monterssari (sic) schools, Julia Gabriel etc..
Actually, I thought Gabe was not to bad already..he started vocalising pretty early....and not all his 'speech' was gibberish too.